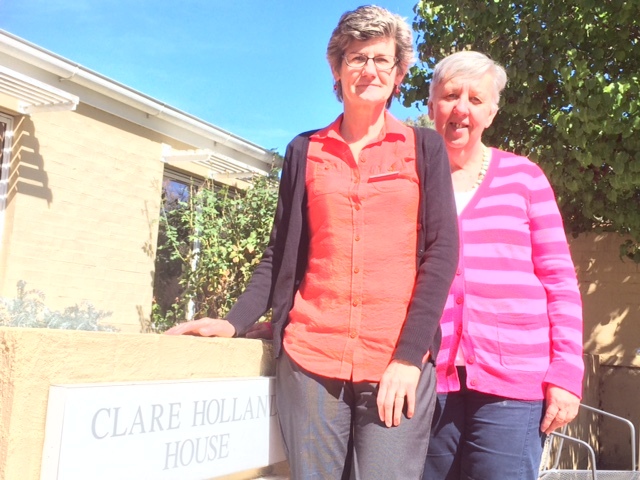 The office of Palliative Care ACT within Clare Holland House is a hive of Palliative Care Volunteer energy. Clare Holland House is operated by Calvary Health Care ACT, and the relationship with Palliative Care ACT means that Volunteers are readily available and well supported within the hospice. It also means that the PCACT team can host Volunteers to visit people at home and in aged care facilities in the ACT. In all they have about 150 volunteers on their books. “We ask people to sign-up for a minimum of 4 hours per week, there are lots of opportunities for people to do 4 hours or more each week”, said Clare Holland House Coordinator Helen Walker “Volunteering used to be middle-class retirement-aged women, but that’s changing now. We have a large body of volunteers who work full time and part time. For example they might come in to do the breakfast shift in the hospice for a couple of hours twice a week and then head off to work by 9am”. Ros and Helen share an office with Coordinator of Volunteers Sue Bromhead who was away on the day I visited. They use the Victorian training material for their Volunteer training, but add a competency-based dimension to it by requiring Volunteers to complete written and verbal tasks before they complete their induction training. In addition volunteers are involved in after-hours reception in Clare Holland House, and they are also involved in preparing and sending out Bereavement Cards as a way of keeping in touch with family members at 2 weeks, 6 weeks and 1 year post-bereavement. They find that the most likely reason for a client to accept a Volunteer is respite and companionship. Do they often find that people say ‘no thanks’ to the support from a Volunteer? “I’d say about 10 times in 6 years” replied Ros. Well done to the team from PCACT at Clare Holland House.